Paid services, like dry cleaning services, must issue a receipt for all of the transactions conducted by their business. It is required by law that all legal and registered business must issue receipts to ensure that they are charging their customers the acceptable rate and taxes for the services that they had taken advantage of. Receipts are created in many different types and formats to specifically fit the needs of different business in different industries, as well as to suit the preferences of different users. More than just a piece of paper, receipts also benefits its users with the advantages that it offers and the many different things that it can be used on. One particular receipt that we will learn about is a dry cleaning receipt. Samples and templates are also provided for your references. 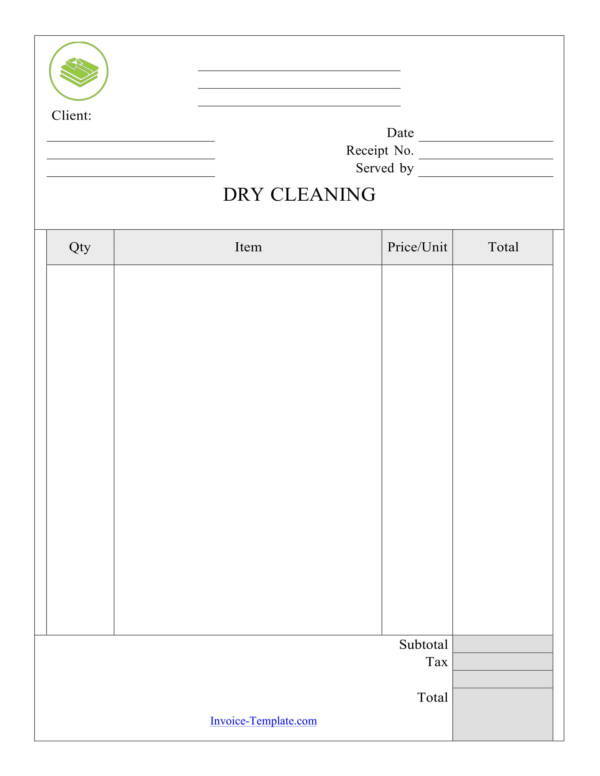 What Is a Dry Cleaning Receipt? Dry cleaning is a service that is offered in many laundry shops or businesses where garments or clothing are cleaned using chemicals without using water to wash off the dirt. Some laundry services only offer dry cleaning services for a variety of clothes or garments. 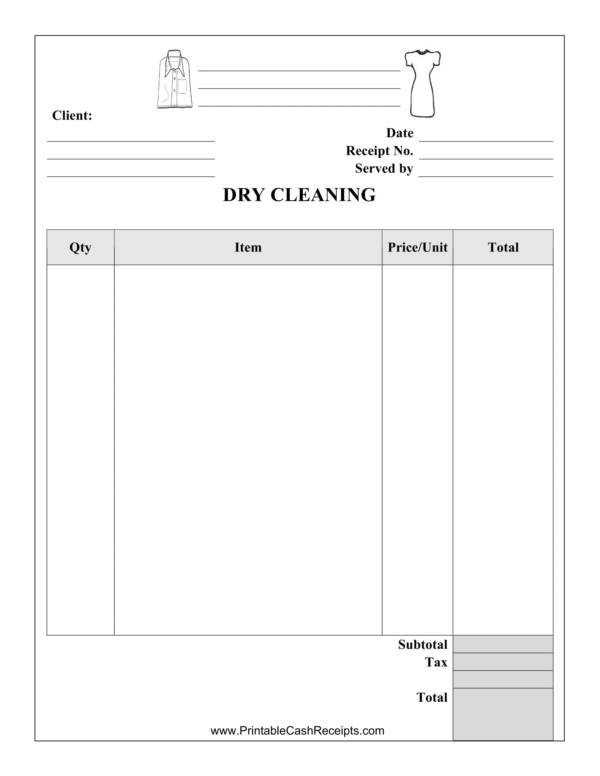 These business issue a dry cleaning receipt to list down all of the services done on particular items for a particular customer, and as proof that the customer acknowledged the service done. Of course, when a receipt is issued it means that the customer has also made a payment for the services they had taken advantage of. 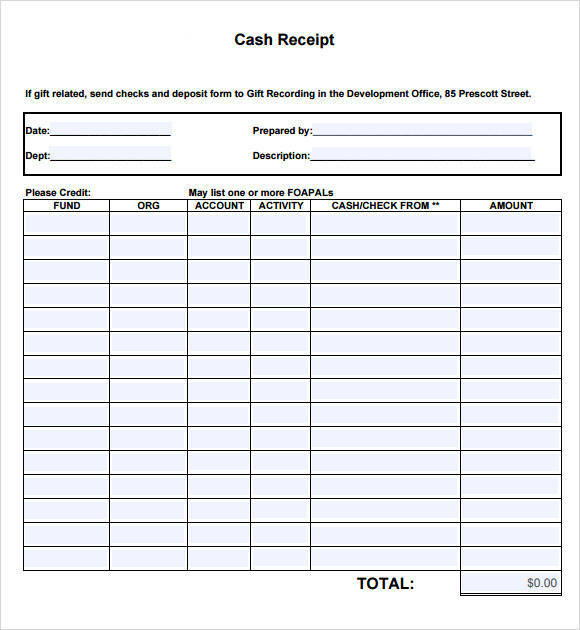 Receipts are used to show compliance to government rules and regulation. This is one of the main reasons why legal or registered business are required to issue receipts to their customers for every paid transaction they make. Small business, such as a dry cleaning business, are able to gather data or information about their customer legally through receipts. Keeping a record a copy of these receipts is beneficial for the business, especially when conducting studies on how to better improve their services and what other services they must add to keep their customers coming. Tax percentage and the actual tax rate must always be part of the items listed in any type of receipt so that customers will know what they paying for. These tax records allow the business to effectively and efficiently keep track of their taxes so that they can declare and pay for the exact amount of taxes that they owe annually. 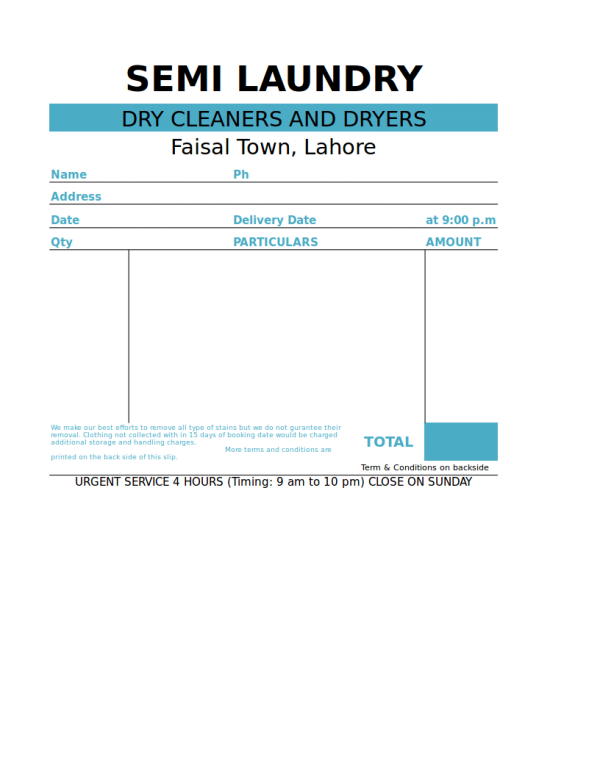 The dry cleaning receipts issued by the business serves as a proof of payment. This indicates that the business has acknowledged the payment made the customer. Customers can also complain about the services they have received, like if it was poorly done or if their belongings were damaged due to the services. The receipt would be proof that the service was done by said business establishment and that they are obliged to compensate the customers for the damages. Businesses are subject to government mandated audits which is very critical regardless if the business is being run honestly. Keeping records of your receipt will come very useful in these situations as they will serve as proof that your business is complying to the required standards. And because you have evidence to support your claim of compliance, you will definitely be able to avoid having to answer critical auditing questions. Every receipt will show the amount every customer has paid for in every transaction so you can use these receipts to keep track of the business’ profit or earnings for a particular period of time. 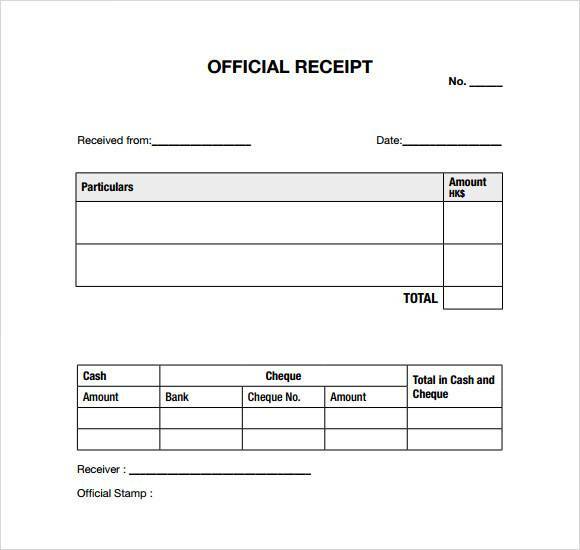 So much can be done with a very simple piece of document such as a receipt. Other related articles you may be interested in are Gift Receipt Templates, Transfer Receipt Templates, and Goods Receipt Templates. What Are the Different Types of Receipt? There are three main types of receipts based on how they are made and they are printed receipts, handwritten receipts, and digital receipts. Each of these three types are used for certain purposes or as preferred by both the seller and the buyer. Let us get into more detail about them. Printed receipts are the most common type of receipt today. They are used by almost all of the establishments in existence, except for some online stores and online services. 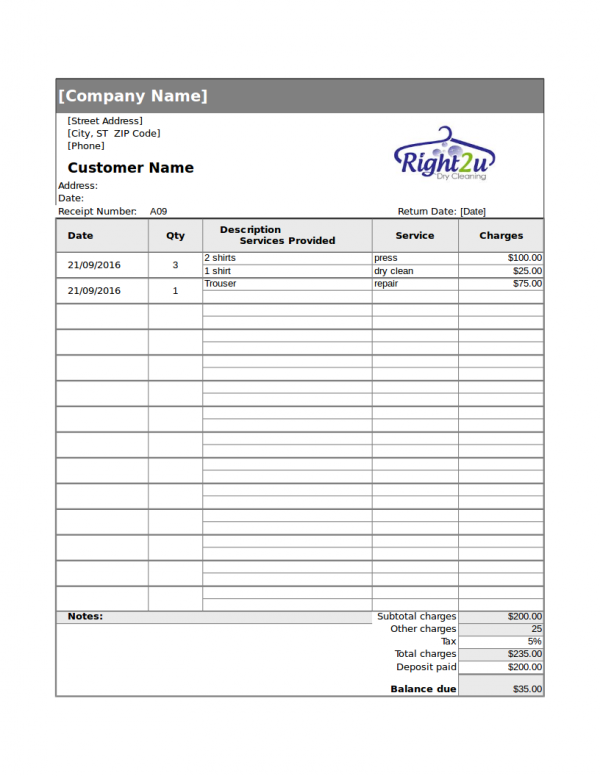 You can get printed receipts from an assortment of establishments both big and small, like malls, convenience stores, grocery stores, mini marts, wholesale and retail stores, and many more. These are the receipts that come out from the small printer attached to the cash register in a store. 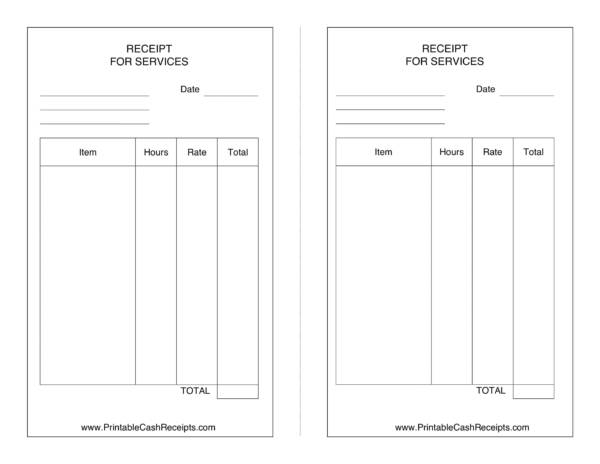 Printed receipts also come in different formats and sizes. With technological advancement, printed receipts nowadays are clearer compared to how they used to look like a couple of years back. handwritten receipts were once the most common type of receipt in existence. Before the cash register was invented and before technology started to make advancements, handwritten receipts were the main and the only way for businesses to issue a receipt. A printed receipt format with carbon paper on the other side is where all the items were listed one by one. The tax percentage and the actual tax amount were also manually computed and written on this receipt. Imagine the time it would take to finish a single purchase? The lines must have been very long at that time. handwritten receipts are still being used today by some establishments who refuse to use cash registers and those businesses who does not find the need to switch to one. And I think they’ll be here to stay for quite some time. You don’t get a tangible copy of your receipt with this type of receipt, which is contrary to that of a printed receipt and a handwritten receipt. How exactly is this possible? 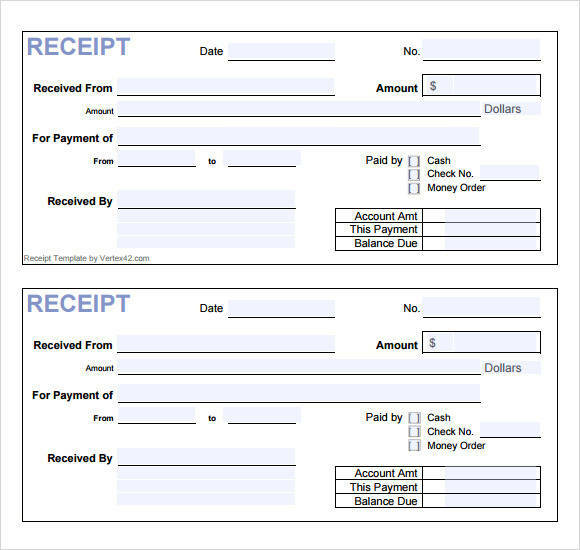 Digital receipts refer to receipts that are sent to one’s email address, online account or cell phone number. This is the reason why it is digital because it is sent via digital means other than a printed copy. Some stores are doing digital receipts to completely eliminate any forms of paper receipts, while other stores provide their customers the option to have it digitally sent or have it printed on paper. Digital receipts are not only convenient, they are also environment friendly because it allows us to save more trees from being cut, by eliminating the use of paper for printing receipts. Other companies are also switching to the paperless billing, which aims to do the same thing as the paperless receipts. Knowing what the three types of receipts are will help you decide the best type of receipt that you should use for your business. 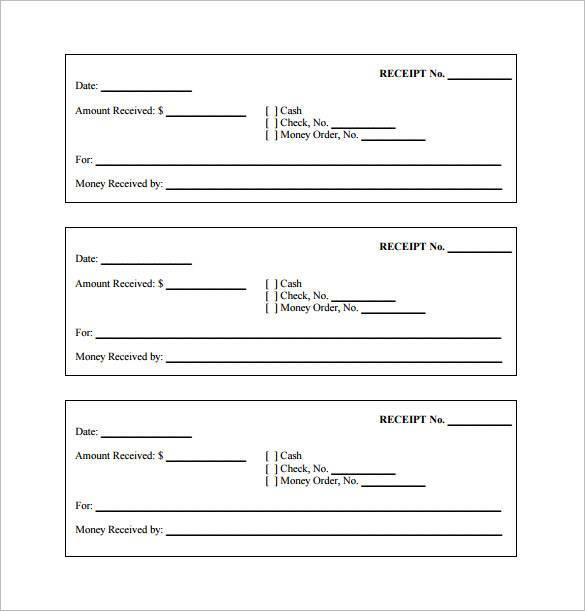 You may also be interested on other related articles about receipts, like Daycare Receipt Samples and Templates, Dental Receipt Samples & Templates, and Bill Receipt Samples and Templates. Can You Return Purchased Items Without a Receipt? Have you been battling or struggling to get an answer to this question for sometime now? Well, it is a tough one so it’s not a surprise if its taking you so long to get a descent answer. Truth is, returning a purchased item with or without a receipt is both possible and not. Wait, that doesn’t sound right. How can that be? As mentioned above, receipts serve as proof of purchase and as an acknowledgement by the seller that they have receipt the exact amount of payment from you. That doesn’t really answer the question and that is also not an answer to the question at hand. Every store or business follow their own set of rules and return policies. This means that it may be possible to return a purchased item without a receipt in one store, but it may be impossible to do so with another. And this directly answers the question asked above. In addition, there are also different exchange procedures or policies followed by every business on when it comes to handling return or exchange transactions. Most businesses allow a full refund of the purchased item that is returned within a specific number of days, while other businesses only allow a replacement or an exchange for a different item with the same price. Still, others prefer store credits or store points instead of a cash refund. This is whether you have a receipt or not. But the chances of getting a cash refund though is high. You may also want to check out other related articles, like Travel Receipt Samples and Templates, Petty Cash Receipt Samples & Templates, and Credit Card Receipt Templates. What Are the Advantages of Receipt Templates? Do you know what advantages receipt templates have to offer? There are quite a lot and you sure don’t want to be the last to know about them. To help you figure out what they are, here are some of the advantages of receipt templates. Receipt templates are easy to find and are readily available online so you will not have to worry about scarcity of resources or not being able to find any. On top of that, almost all of them are offered for free. Just in case you can’t find the receipt template that you want or the type that you prefer to use, well then you can simply edit any receipt template of your choice. These templates are created in applications that are familiar to us that is why you find it pretty easy to make changes to it. 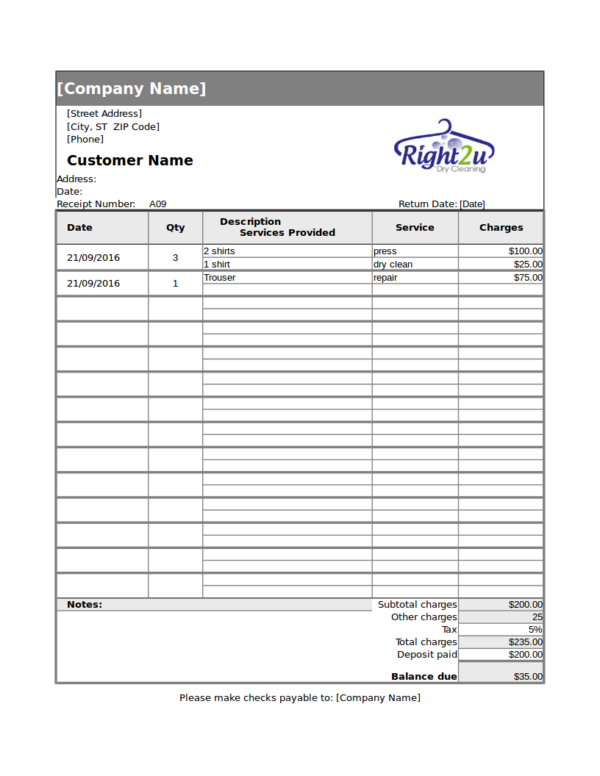 Using receipt templates will help you create and produce a receipt for your business easily and conveniently. You can print as many copies of this receipt as you want. They already include the complete set of details or information that you need for a complete and reliable receipt. So you will not be missing any important data on it. The best thing about receipt templates is that they are very easy to use. 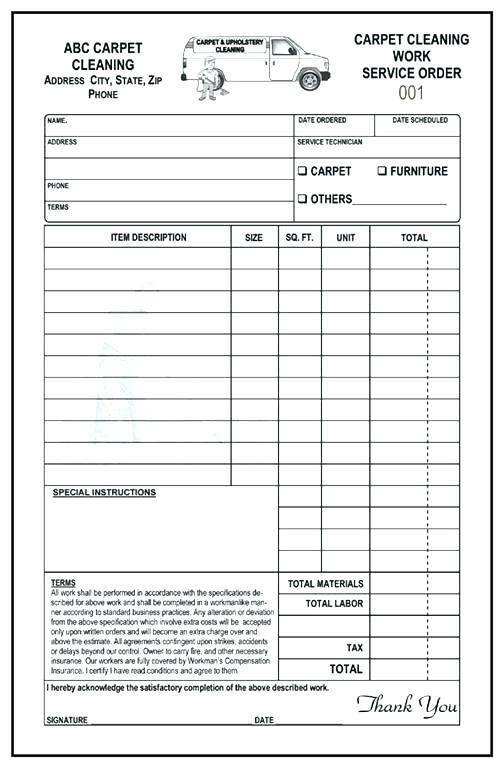 All you need to do is fill out the required details, save and then print. Then you have a printed receipt to give to your customers. 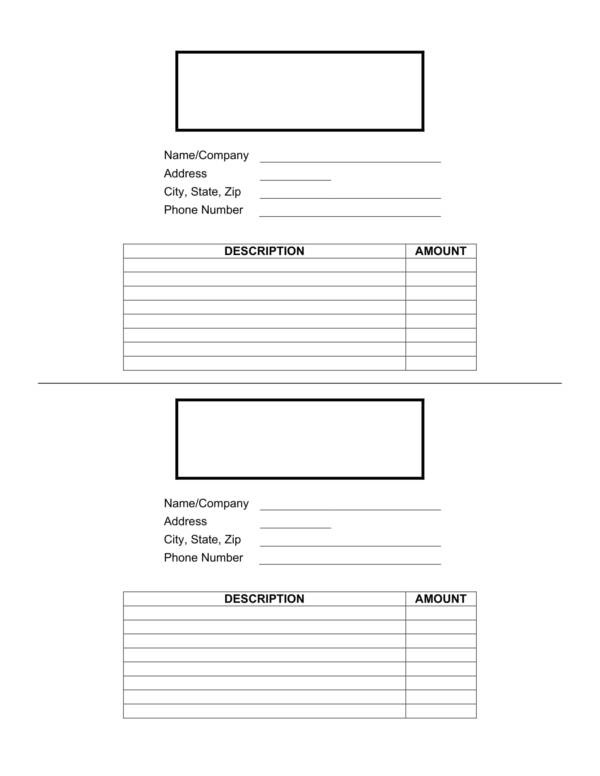 If you have not thought of using receipt templates before, then it is about time that you do. It is never too late to start using something this useful. We hope that you were able to find this articles useful. If you do, you may also check out other related topics on our website. 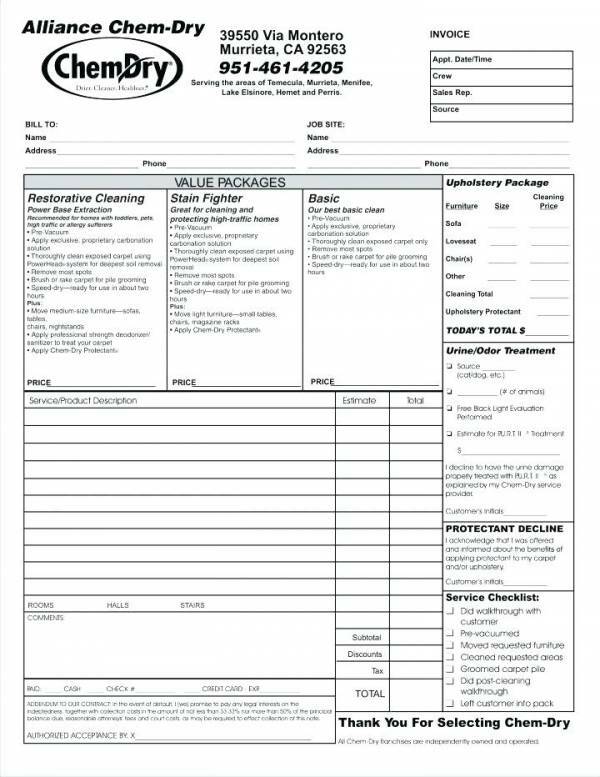 Some of the titles we offer that you may find interesting are Purchase Receipt Templates, Sample Cleaning Service Receipts, and Company Receipt Samples & Templates.